A Danish television company created Hugo the Troll way back in 1990 and his purpose was to save his family after fighting the forces of evil. Hugo became a star on video games, magazines and several TV shows ever since. 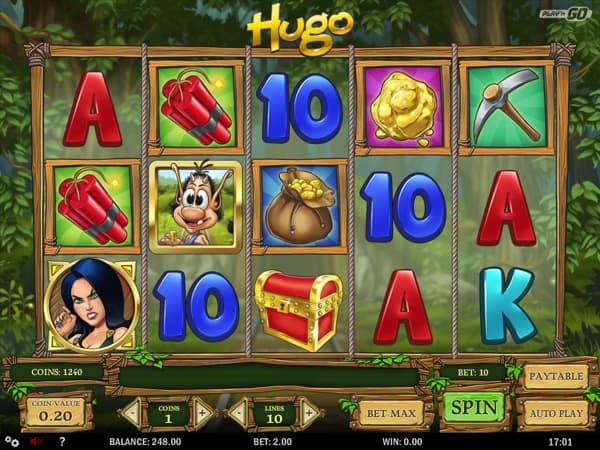 Play n Go developed an online video slot based on this heroic character and it’s simply called Hugo. Hugo is presented on 5 reels with three rows and features 10 pay lines. The slot game also comes with numerous bonus features including wilds, scatters, a free spin feature, a bonus game and a top paying jackpot bonus worth 2,000 coins. The background takes place deep inside a dense forest with lush green trees filling up the backdrop behind the reels. The semi-transparent reels are surrounded by a wood frame while the reels are separated by rope. The betting platform received the same decorations with leaves, wood and rope presented across each betting option. There are four high valued symbols that include Hugo’s mining equipment such as dynamite sticks, a pickaxe, a bag of gold and a gold nugget. The lower valued symbols include the standard 10, J, Q, K, and Ace to complete the set of symbols found on the reels. Hugo provides a fantastic variety of betting options to cater to slot enthusiasts and beginners alike. You will be able to select between 1 and 10 pay lines and place a coin denomination on each pay line ranging from a minimum of £0.01 to a maximum of £2.00. The maximum bet you will be able to place on a single spin is £100.00. Our legendary hero Hugo represents the wild symbol and will stand in for all other standard symbols except the scatter symbol and bonus symbol available in the game. Scylla the Witch acts as the scatter symbol and will unlock the free spin feature in the game while the treasure chest represents the bonus symbol. Receive 15 free spins with each scatter paying 1 time your total bet. You can also re-trigger the free spin feature during the free spins round and Hugo will appear stacked on the reels to create more winning opportunities. The Hugo bonus game is triggered by displaying three treasure chest bonus symbols on reels one, three and five. Once triggered, you will need to work your way through numerous levels in the gold mine to locate treasure chests. Every successful pick will award you with cash prizes until you find Don Croco where the bonus game will end. Hugo is a low to medium variance video slot with a Return to Player of over 96%. The game is extremely well designed and offers smooth gameplay functionality with several lucrative bonus features to keep you entertained. We have embedded a demo version of Hugo below so that you can try the game for free.